I use data driven pages to produce several maps. In the end product, all maps should show point data on a Country of europe. So far the country is shifting around each time I change the data shown in the map. However, I want the country to stay in the middle of the map when I export the maps with a scale of 1:750'000. I tried all Options in the Data Driven Pages Set Up (best fit, Center and maintain current scale and data driven scale). I have a trick that worked when using a surface layer. Not sure if it will work with points. Choose "Specify using Page Units"
Unfortunately I just checked and the "Best Fit Option is disabled when working with Point layer. So I guess you can trick ArcGis even more by converting your points to small circles using buffer tool, so that "Best Fit" option will be available. Alternatively you can also use QGis instead. Here's something I use for Data Driven Pages, it might be pretty basic compared to other options but it works in a pinch. Make a new polygon shapefile in the shape of a rectangle edited so that it has no fill and a solid outline. In data view place your shapefile so that it surrounds the area you want in your map. Open attributes and set up new columns for scale and rotation. 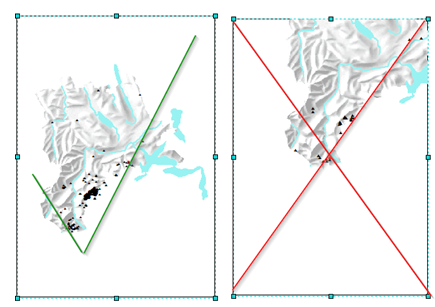 Set the scale to match the desired map scale and use rotation to denote horizontal or vertical etc. In the DDP set up, set the layer, id, rotation, and spatial reference to the corresponding columns in the shapefile's attributes table. Make sure the size of the shapefile matches the scale of the map when you switch back into layout view. This might involve some measuring and math on your part. (i.e. in layout view, measure the dimensions of what your printed map will look like and go from there. for example: for a scale of 1:750,000 you may need a rectangle measuring roughly 312k x 197k meters). When you refresh the DDP, it should align itself with the shapefile. If you sized the shapefile correctly you should be able to just see it (depending on how thick your line width is) along the edge of the map. You can then turn the shapefile layer off so that it doesn't show up in the layout view. the DDP will still align to it. This may seem tedious if you need several maps, but I've found it easy to copy and paste the shapefile and rotate/move it to your needed spot instead of trying to find a point to base the DDP on or drawing a new shapefile for every map. 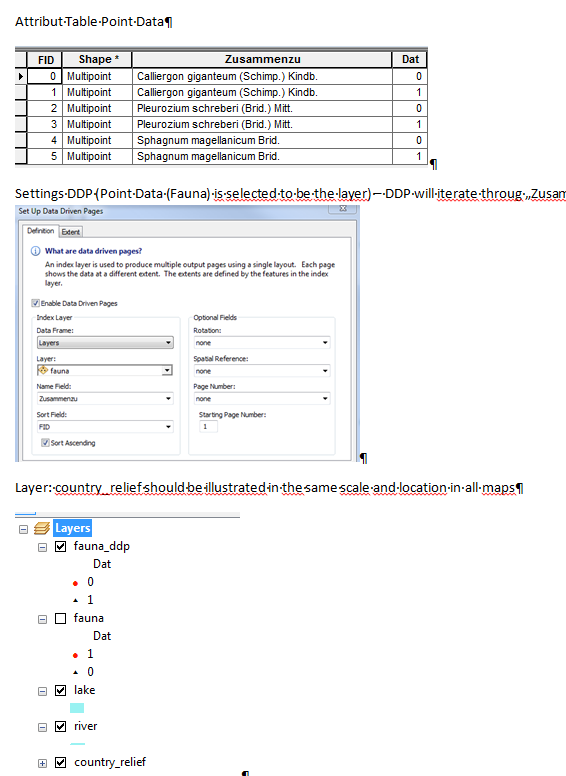 If you set the "sort field" in DDP settings to the shapefile ID, arcmap should make new page for every new shapefile that you make. Create a polygon that matches the extent you want. Do a spatial join on the polygon with the points table to get a polygon for each species type. Use the polygon as the ddp index layer. Use the points layer and enable page definition select the show matching. All points with the same species will show on the output. Not the answer you're looking for? Browse other questions tagged arcgis-desktop extents data-driven-pages layouts data-frame or ask your own question. Making Scale Bar end in zeros for Data Driven Pages?